Optical Flares is a plug-in for designing and animating realistic lens flares in After Effects. 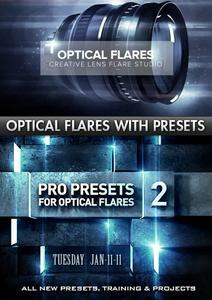 The Pro Presets is a collection of 50 detailed high-end flares set up with shimmer animation, edge flare-ups and more. This collection offers greater versatility to the 60 built-in presets as well as providing creative ideas and usage of elements. Also, each object can be saved and combined with your other lens flare presets.